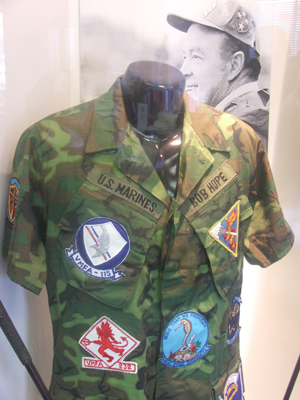 The late comedian Bob Hope's Marine Corps fatigues, which he wore during his USO tours during the Vietnam War. They're on display at the Bob Hope USO at Los Angeles International Airport. 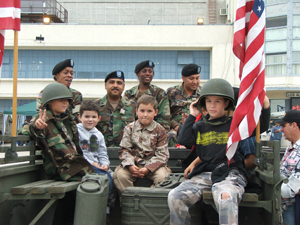 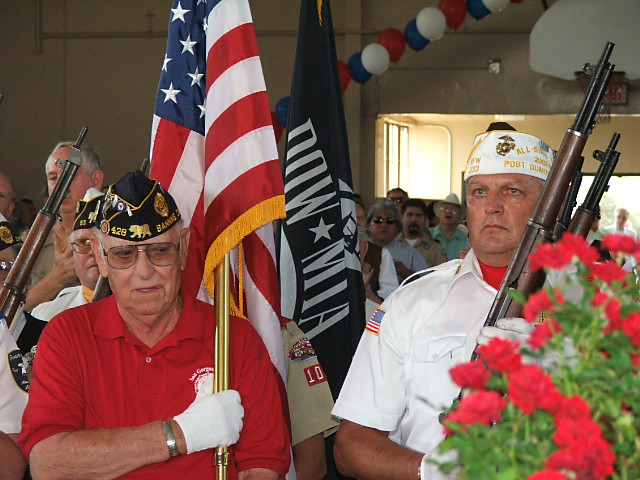 Kids and Soldiers during the July 4th celebration at the Joint Forces Training Base, Los Alamitos, California, 2005. 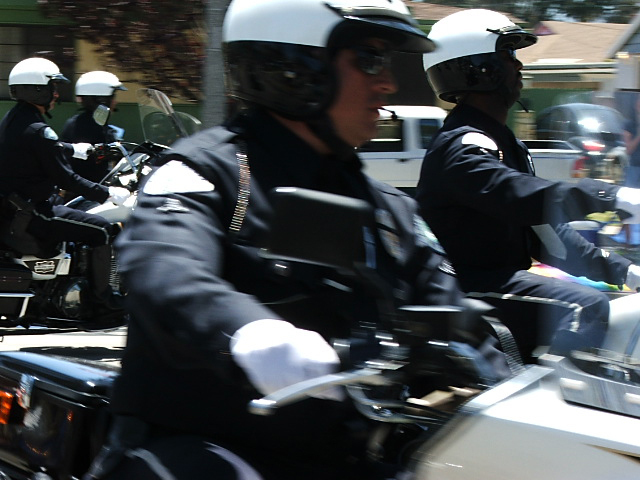 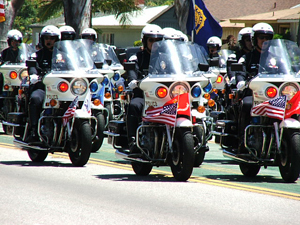 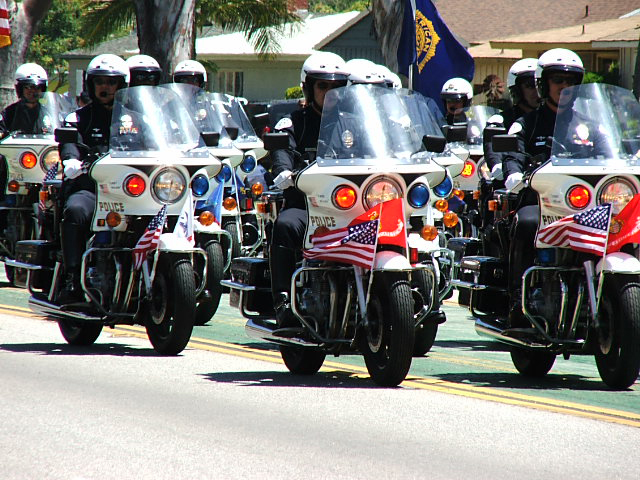 Motorcycle Detachment of the Los Angeles Police Department performing during the Torrance, California Armed Forces Day Parade, 2006. 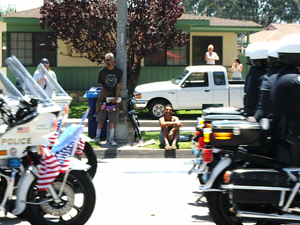 This photo was a misfire, but I sure do like the symmetry of it! 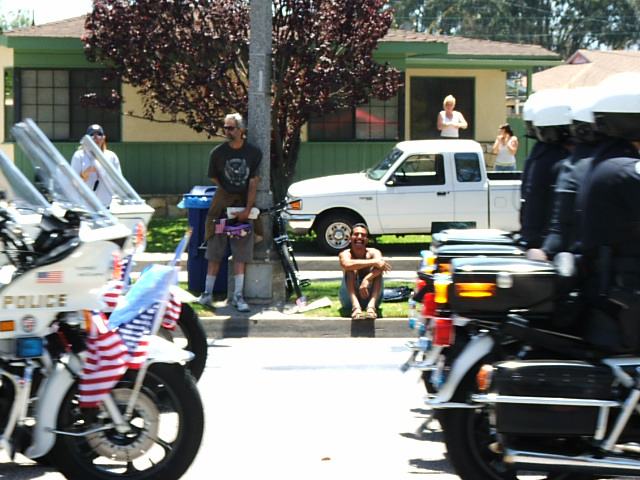 One happy onlooker at the the Torrance, California Armed Forces Day Parade. 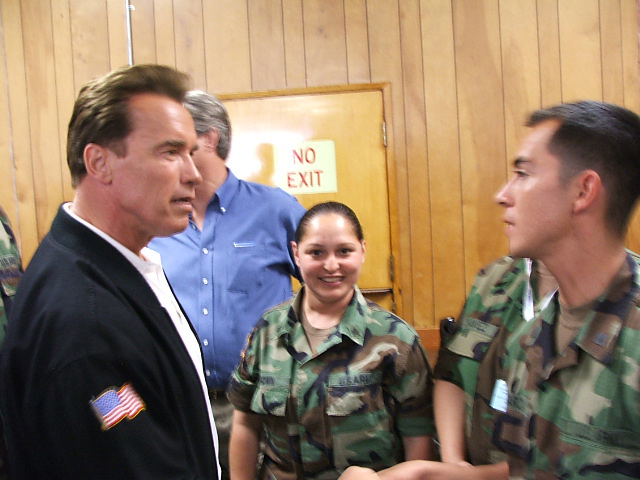 Governor Arnold Schwarzenegger consoles the brother of troop KIA in Iraq. 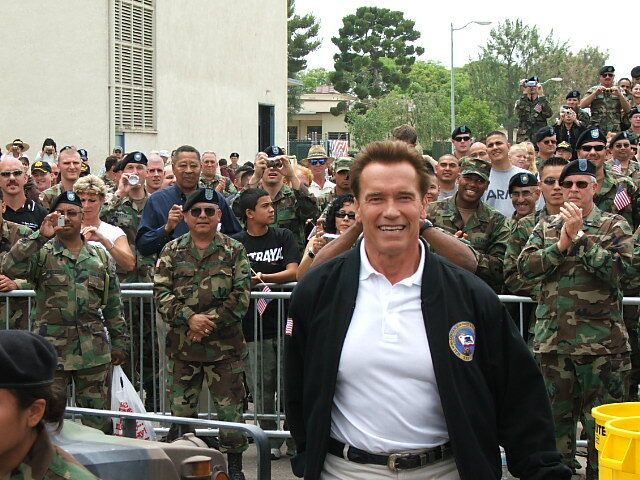 Governor Arnold Schwarzenegger caught in a reflective moment at the Joint Forces Training Base. 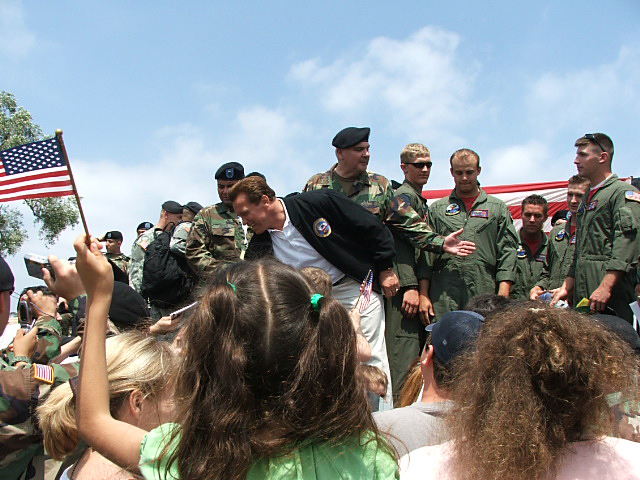 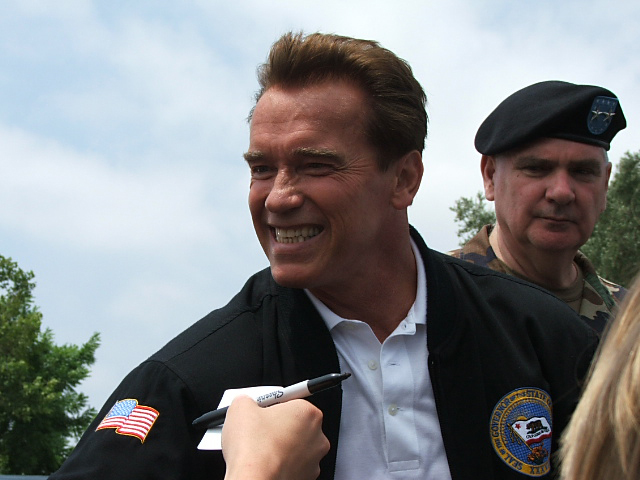 Governor Arnold Schwarzenegger thanks the troops during Soldier Appreciation Day at the Joint Forces Training Base, Los Alamitos, California, 2006. Honor Guard at the Banning, California National Guard Armory prior to a ceremony welcoming Soldiers of the 40th Infantry Division home from Iraq. 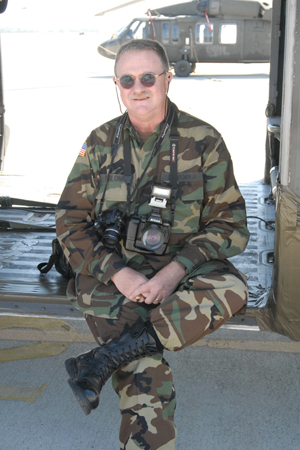 CWO-2 Marc Yablonka, on the flight line at the Joint Forces Training Base in Los Alamitos, California. 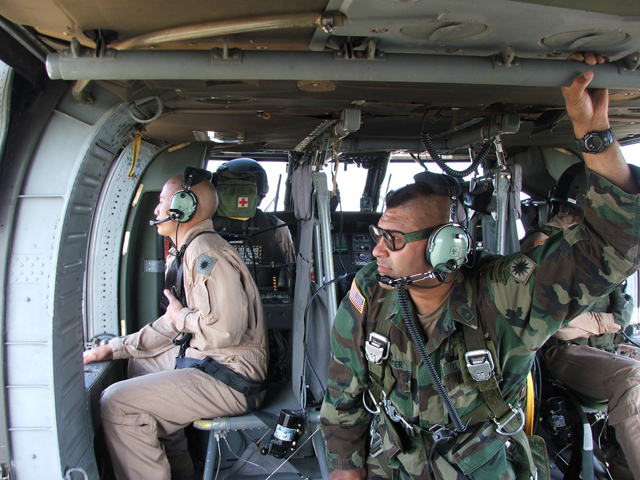 Chief Yablonka arrived a little early for a Blackhawk flight. 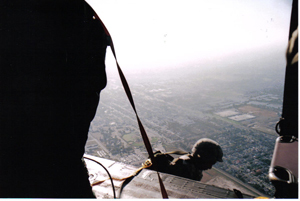 Photo courtesy Marc Yablonka collection. 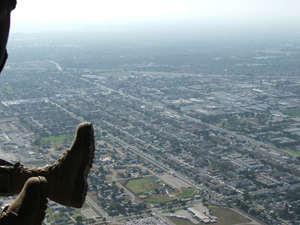 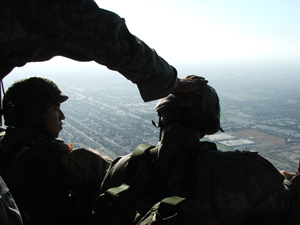 California National Guard paratroopers perform a series of "Hollywood Jumps" (without their usual gear) over the Anderson Drop Zone, Joint Forces Training base, Los Alamitos, California. Jumps occurred during the July 4th celebration on post in 2007. 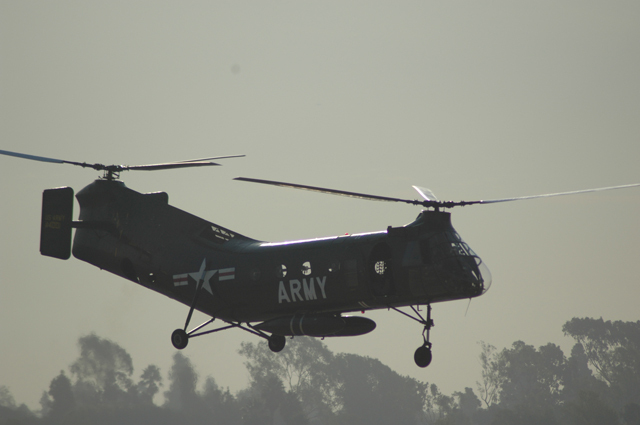 A Piasecki H-21 "Flying Banana," the first helicopter used in the early stages of the Vietnam War, prepares to set down on the flight line of the Joint Forces Training Base, Los Alamitos, California, during the annual Wings, Wheels and Rotors Expo which occurs on post every October. 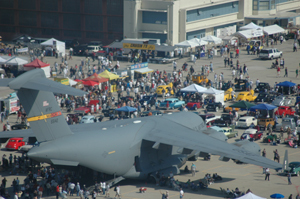 A USAF C-17 Globemaster from March Air Reserve Base in Riverside, California, as seen from aloft at the annual Wings, Wheels, and Rotors Expo at Joint Forces Training Base, Los Alamitos, California, 2007. 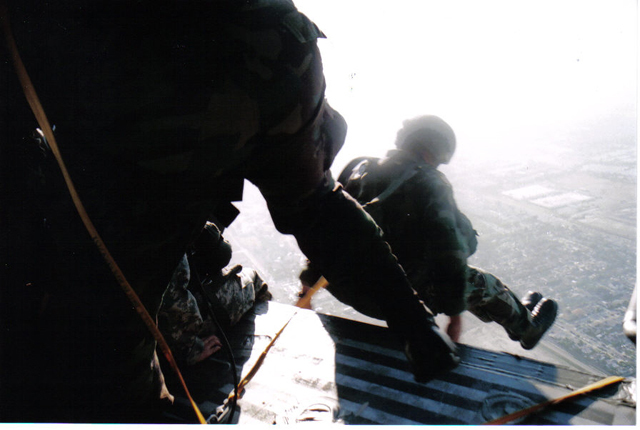 To paraphrase from the Nancy Sinatra song, "These boots are made for jumpin', and that's just what they're about to do!" 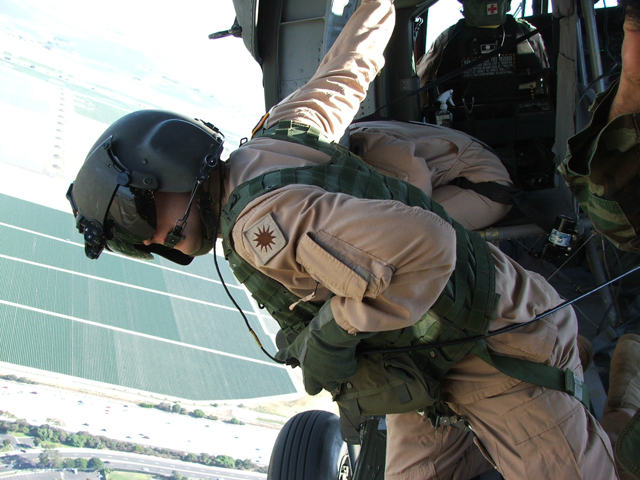 Crew Chief making sure paratroopers have all gotten away clean from a California National Guard Blackhawk over the Anderson Drop Zone, Joint Forces Training Base, Los Alamitos, California. 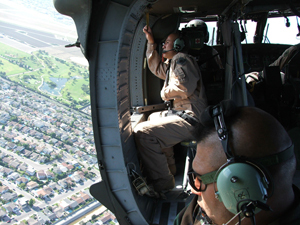 Crew aboard a National Guard Blackhawk checking weather conditions prior to paratroopers aboard carrying out July 4th "Hollywood Jumps" above the Anderson Drop Zone, Joint Forces Training Base, Los Alamitos, California. Governor Arnold Schwarzenegger clowns with the young son of a California National Guardsman serving in Iraq, The boy's mother looks on and his sister looks bored! 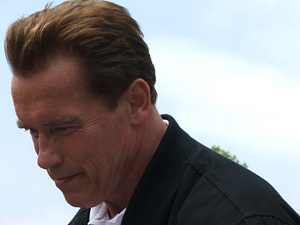 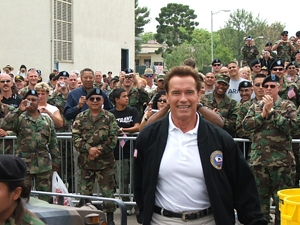 Governor Arnold Schwarzenegger prepares to thank the troops posted to the Joint Forces Training Base, Los Alamitos, California during Soldier Appreciation Day, 2006. Governor Arnold Schwarzenegger at the wheel of a Humvee, while Brig. 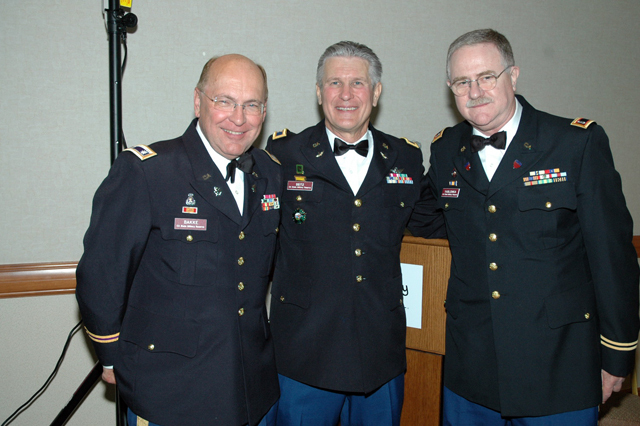 Gen. Thomas Eres, former Commanding General of the National Guard, smiles on. 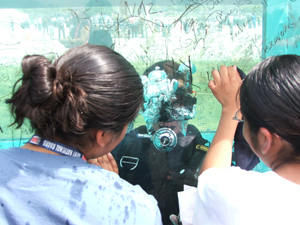 A U.S. Navy diver enthralls two kids from his vantage point inside a dive tank on display at the Raytheon Corporation, El Segundo, California during a military appreciation day, 2005. Actors Max Martini (red tee-shirt) and Michael Irby (white shirt), of the hit TV series "The Unit", with two troops of the 63rd Regional Readiness Command, U.S. Army Reserves during Soldier Appreciation Day, 2007. 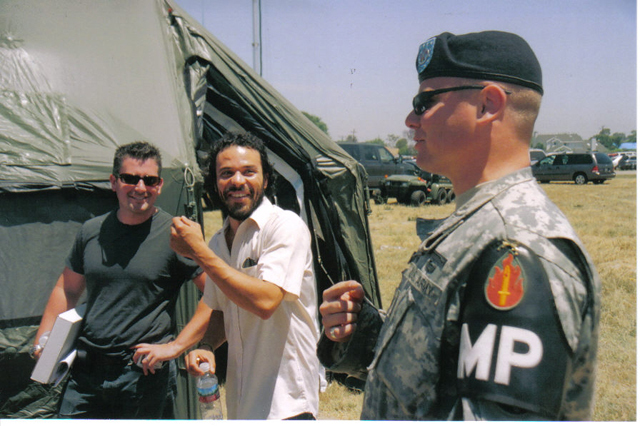 Actor Michael Irby, of the hit TV series "The Unit", appears about to be given the boot by an MP of the 63rd Regional Readiness Command, U.S. Army Reserves, during Soldier Appreciation Day, 2007. 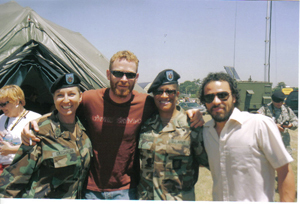 CWO-2 Marc Yablonka with Michael Irby and Max Martini, cast members of the TV series the Unit. 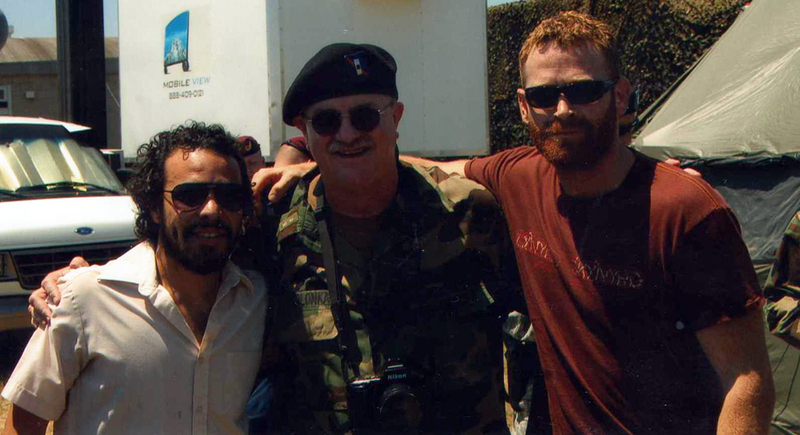 Martini also starred in the Steven Spielberg film Saving Private Ryan and other films. Nikon with high-powered zoom in hand, 46-Quebec Marc Yablonka, California State Military Reserve, about to be lifted out of harms way by the L.A. County Sherriff's Aerial Division before being accosted by a beautiful blonde whom he never saw again! 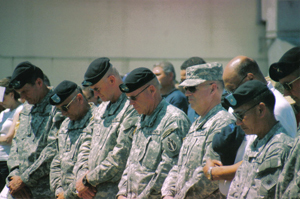 Photo courtesy SSG Gene Arias, Installation Support Command, CA-SMR. 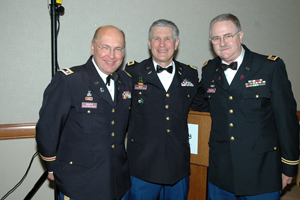 LTC Roman Bakke, COL Pete Seitz, CO, Installation Support Command, California state Military Reserve, and CWO2 Marc Yablonka, who MC'd, at the SMR Christmas dinner 2007. 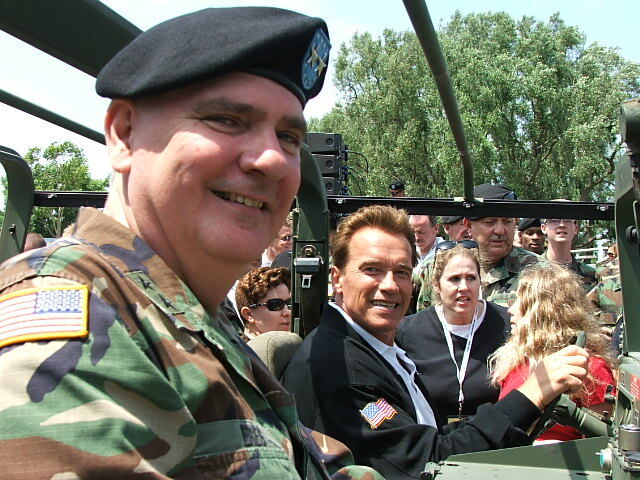 Photo courtesy Marc Yablonka collection. 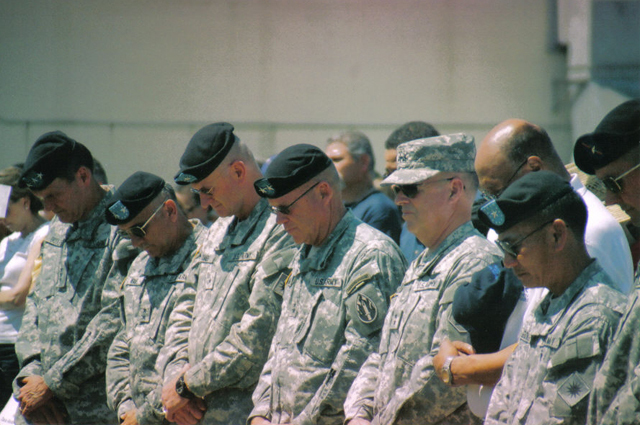 Commanding Generals at Joint Forces Training Base, Los Alamitos, California bow their heads in prayer during opening invocation of Soldier Appreciation Day, 2007. All images © Marc Yablonka. 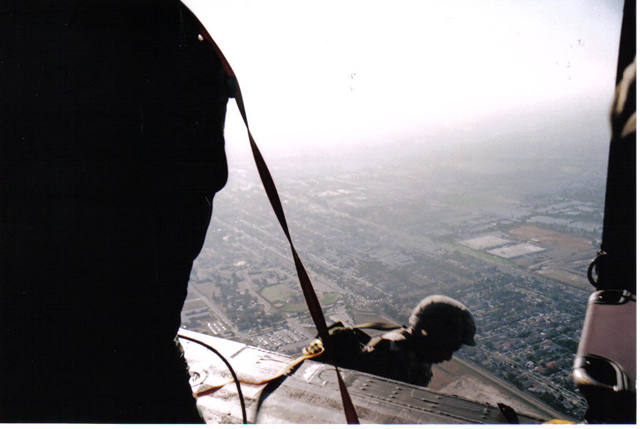 Use by permission only.